A priority encoder is a circuit or algorithm that compresses multiple binary inputs into a smaller number of outputs. The output of a priority encoder is the binary representation of the original number starting from zero of the most significant input bit. They are often used to control interrupt requests by acting on the highest priority encoder. If two or more inputs are given at the same time, the input having the highest priority will take precedence. An example of a single bit 4 to 2 encoder is shown, where highest-priority inputs are to the left and "x" indicates an irrelevant value - i.e. any input value there yields the same output since it is superseded by higher-priority input. The output V indicates if the input is valid. Priority encoders can be easily connected in arrays to make larger encoders, such as one 16-to-4 encoder made from six 4-to-2 priority encoders - four 4-to-2 encoders having the signal source connected to their inputs, and the two remaining encoders take the output of the first four as input.The priority encoder is an improvement on a simple encoder circuit, in terms of handling all possible input configurations. 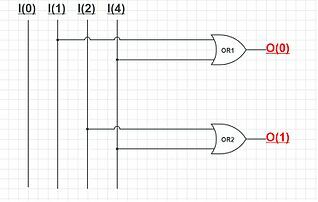 A simple 4:2 Encoder using OR gate. A simple encoder circuit is a one-hot to binary converter. That is, if there are 2n input lines, and at most only one of them will ever be high, the binary code of this 'hot' line is produced on the n-bit output lines. ^ M. Morris lora, Michael D. Ciletti, "Digital Design", 4th Edition, Prentice Hall, 2006, ISBN 978-0-13-198924-5. This page was last edited on 30 November 2017, at 15:19 (UTC).